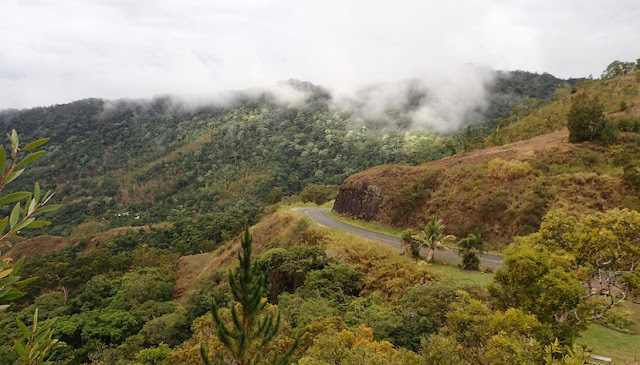 View from totem turnout lookout trail, West of Canala, New Caledonia. Your thoughts -- what's on his mind? 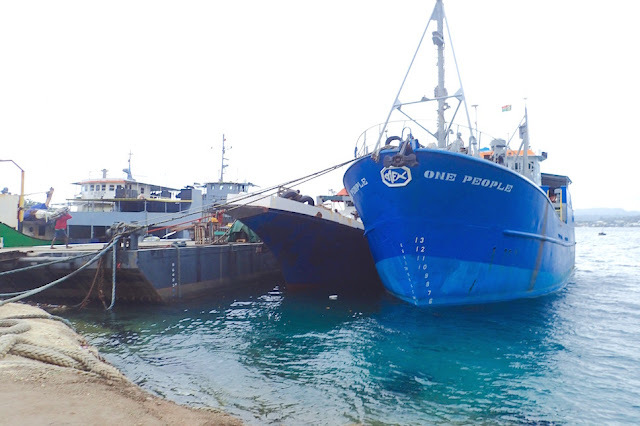 Canala New Caledonia was another "Plan B" we're happy happened. Originally, I'd planned our West to East mountain crossing less far North from Noumea, from Boulouparis to Thio. For touring, we believe mountain roads are best enjoyed at a more leisurely pace. 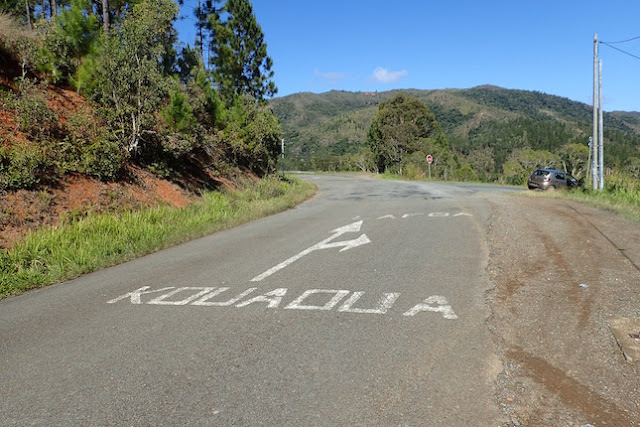 New Caledonia's width is not great, but very windy and mountainous, and given the prior day's late start, we opted to stay on the West Coast a bit longer. Thus, as the afternoon waned on the second of our multi-day road trip, Canala offered the most camping options. Besides, it was on our way to the coast -- or so I thought at the time! Even as misty clouds rolled in, we found the countryside and its vistas magnificent! At one point, just beyond a tulip tree a-flower with large, flame-colored blossoms, we noticed a pair of carved wooden poles joined with a wooden arch, reminiscent of the Kanak village doorposts we'd seen earlier in a Noumea museum. Behind the arch was a knoll with steps leading up. We pulled in. 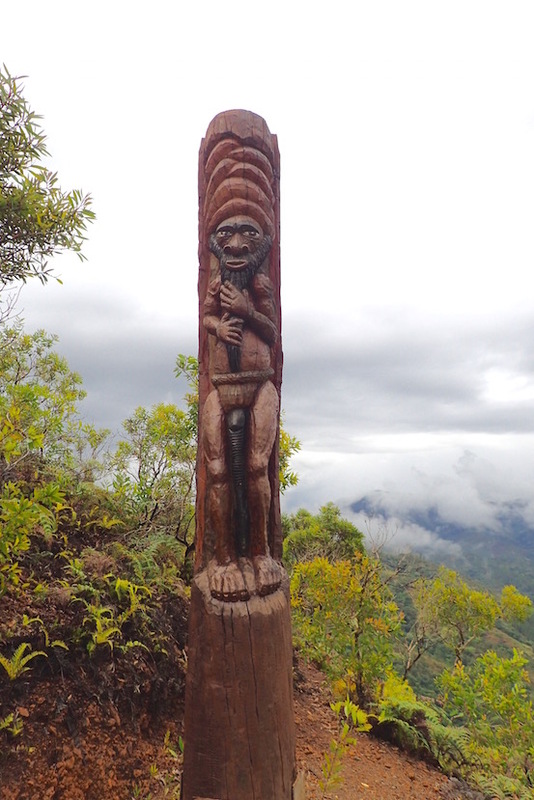 Spectacular as the short trail vistas were, the trail's carved totems were the highlight for us both. I'm a hopeless sucker for native woodcarvings, and these were particularly well-done. 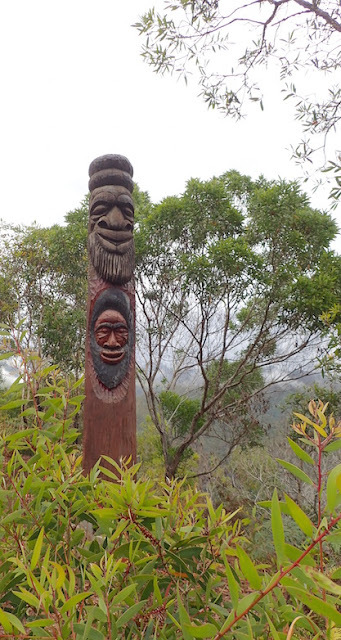 More happy totems at the lookout West of Canala, New Caledonia. 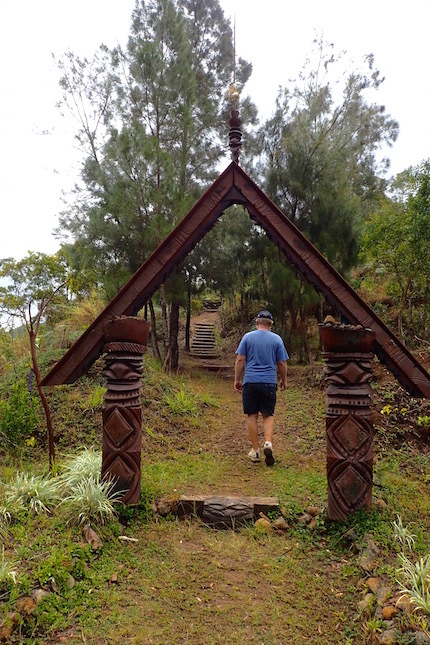 "What I love about the Kanak totems," Wayne opined, "Is unlike the ones we see in the Pacific Northwest, these are really happy guys!" Indeed, even without the oft seen long -- errr "manhood sheaths" (for those that have them; let's just say Kanak carvings are the antithesis of Ken and Barbie doll de-sexualization) -- these guys have great expressions. They're usually happy or at least mischievous-looking. Determining whether their physical prowess and expressions are related I leave up to you. Rain or shine, they lift our spirits. We just can't help but smile back. Interestingly, there were no notes about this stop in any of our resources. Nor were there any placards anywhere on the trail. If you're traveling between La Foa and Canala, watch for it on the valley side. Despite all Canala's camping options, we were having trouble matching Visitor's Center accommodation descriptions with roadsigns for camping. At that stage, given it had started raining, we were seeking the one non-tribal campsite that also advertised a bungalow. Given my limited French skills, I was reticent to use the phone for help, knowing the odds of finding an English-speaker on the other end of the line were slim. After passing through the town of Canala once, we circled back. Canala campground sign (not on main road). First we stopped at Canala's marie (town hall), a beautifully crafted and apparently relatively newly constructed building. Across the street was a cultural center. Alas, as we were in a French territory and it was after 4 pm, they were all closed. Again, like the highway totem vista trail, these spots were not mentioned in any of our research. Next we stopped at the larger of two general stores in town to ask for help. The gal at the register sent me off in search of her somewhat-English-speaking colleague through the maze in the back. I found her directing a couple local delivery guys wearing Rasta shirts other Rasta accoutrements and smoking something suspiciously herbal campfire-scented. I explained what we were looking for, showing her in the guide book, and that I wasn't sure how to find it and was really looking for someplace with a roof over our head, given the rain. What constituted rain shelter at our campsite. It worked. 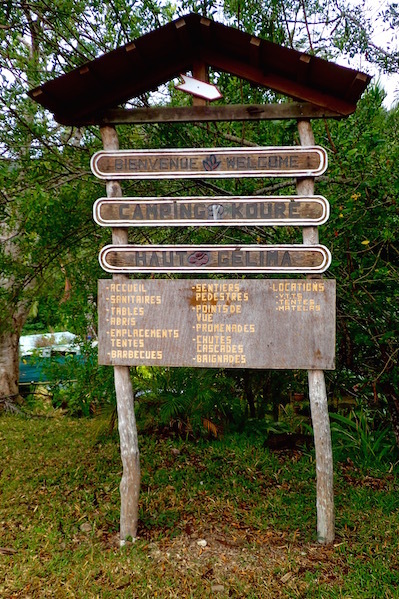 Campground East of Canala, New Caledonia. Walking back to the store's front, she offered to call the place I was seeking for me, but in the process, chatting with another local, he offered to show us by having us follow him. Gratefully, we did. It's not surprising we were puzzled; there was no sign matching the guidebook description on the main road, but the sign we were led to matched the book. What a difference a day makes! Our campsite what a whole different place in the morning. East of Canala, New Caledonia. Wandering in the rain, we found the campsites (which matched the accommodation book description and image), but no office, no bungalow and no body but us. We found a largely decommissioned communal kitchen -- dusty with an unplugged refrigerator, rusted out stove/oven and waterless sink) and a phone number to call and an honor box for payment. Again, given my limited French I was reluctant to call. Then we found the bungalow, but it was locked. I called. I eventually was able to gather the bungalow I was looking at was the only one, and that it was locked because it was unavailable. The fellow I called magically appeared a few minutes later. We agreed given the rain and the bungalow's unavailability, the best solution was to set our tent up under the dining area awning, over the hard-packed dirt. At this point, it was nearly dark, and the less than joyous choice between a softer but wet campsite versus a very hard but dry spot with flat air mattresses was akin to choosing between a rock and a hard (soft, wet) place. 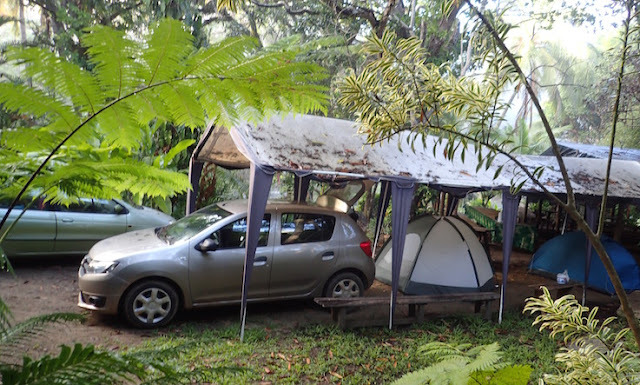 At least with the awning, we had the convenience of pitching the tent right next to our car. 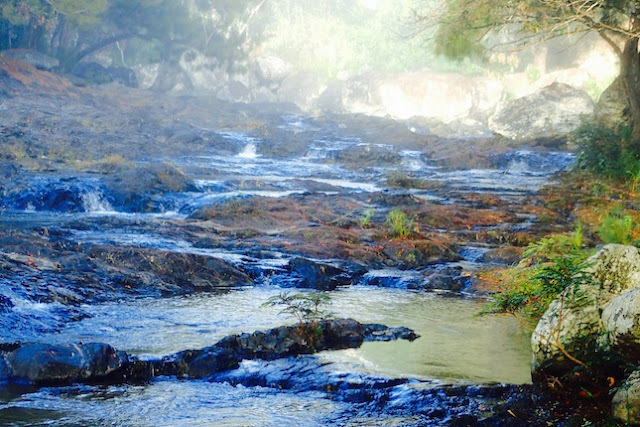 Dawn, another portion of the stream alongside camp. East of Canala, New Caledonia. To sweeten the deal a bit, the owner returned with a light bulb. He also showed us the electrical outlets we could use, which was a nice perk for someone whose plugs weren't from the US. Wayne was more pleased with our choice when two hours later, out of the darkness, two attractive young gals showed up, one French, her friend, New Caledonian, trying to decide where to pitch their tent. We showed them the options, the honor box and offered them dry space next to us under the awning if they preferred. They did. The morning shone dry, bright and sunny. Truly, it was a beautiful spot. Sophie and Caroline, our camping neighbors, generously heated some extra hot water for us for morning coffee on their camp stove. They then set off for the stream crossing and viewpoint hike - an hour each way, and we hit the road. 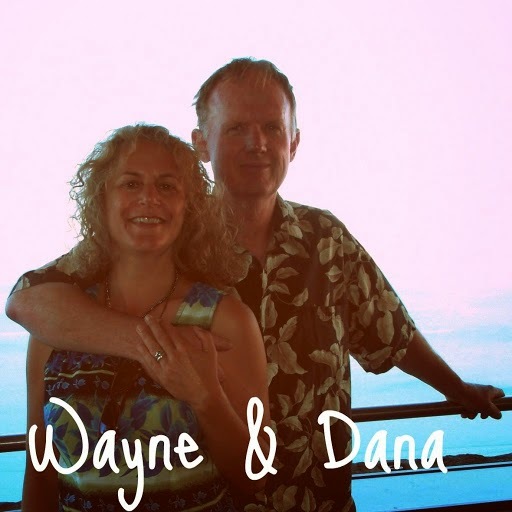 Wayne realized Canala was actually a slight diversion on our way Northbound along the East Coast. 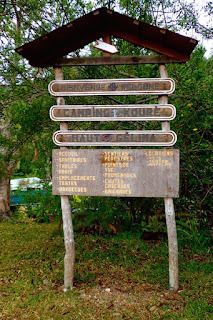 Nonetheless, quite likely it would've been dark by the time we arrived at the next place where there were campsites, two widely spaced towns (Houailou, past Kouaoua -- boy these New Cal towns have a overabundance of vowels!) away. 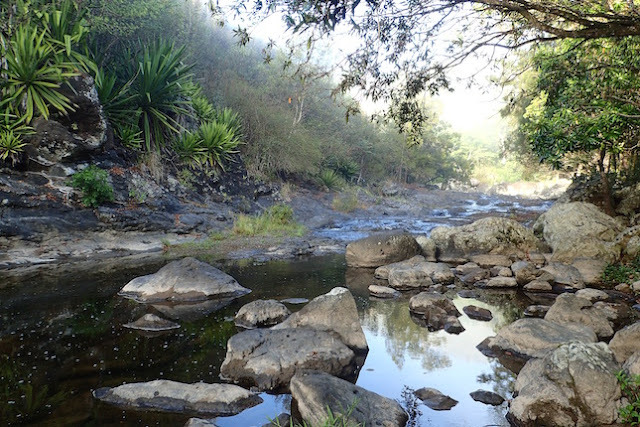 Besides, the campsite, Chez Miguel, was a beautiful spot along a river, with lots of covered picnic tables, good space between the campsites with enough landscaping to feel somewhat private, running water, flush toilets, (cold water) showers, a large communal eating area and electricity. The price: $15. By the way, the couple who rented the bungalow did eventually show up, though we never met. They left even earlier than we did. We recommend showing up with a working camp stove, air mattresses that stay inflated, and arriving in daylight hours when it's not raining. The way we were supposed to go... to Kououa. 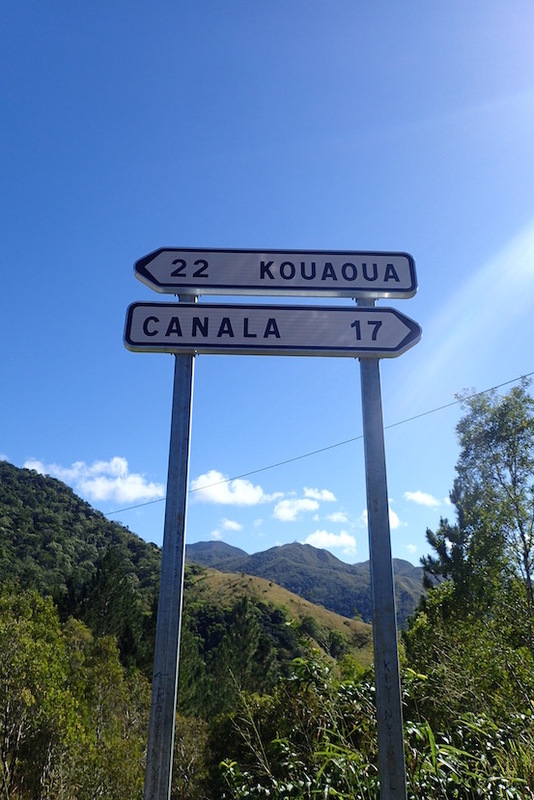 Accidental stop or not, if we had it to do over, we'd spend more time in and around Canala. The people we met were friendly and helpful. There was an interesting turn-of-the-century building we noticed but didn't check out. Canala looked like a good place to get a better sense of Kanak culture (driving by, there were a few other places in town that appeared cultural besides the building across from the town hall )without having to sleep in a village. 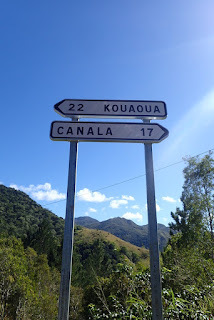 We returned to Canala on our way back to our missed turnoff to complete our crossing to the East Coast, once again feeling particularly satisfied with our mistakes. It's all part of the adventure! Kouaoua turnoff -- we almost missed it again! At least this time it was sunny, which made this easier to read the in the rain. RT Day 3: Farino to Canala, departed campsite at 9:45, several stops / hikes, arrived at campground ~ 5pm, 91 km (56 miles). 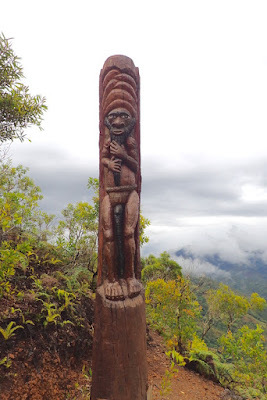 The previous post includes some stops -- Giant Fern Park, and Saramea's Trou Feulliet aterfall and Sarramea in those 91 km.